Disse fire solproduktene er nye i 2016. 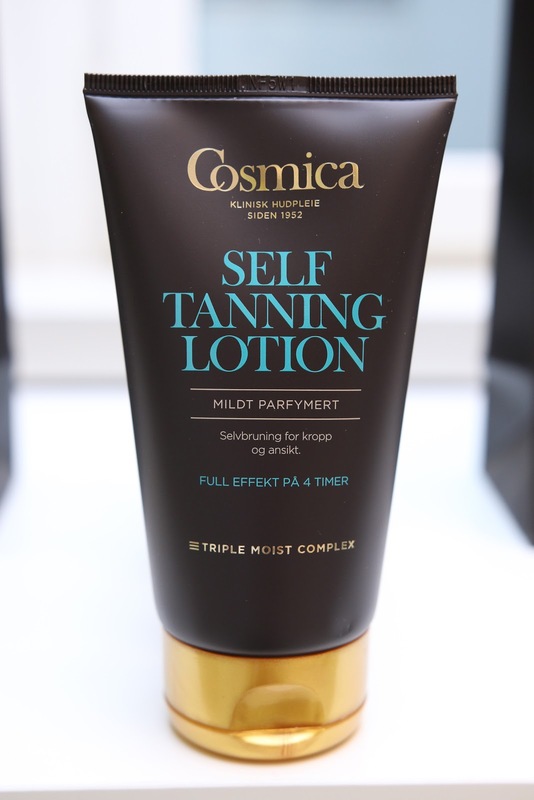 Cosmicas populære Moisturizing Sun Lotion faktor 30 kommer nå i stor størrelse på 300 ML. 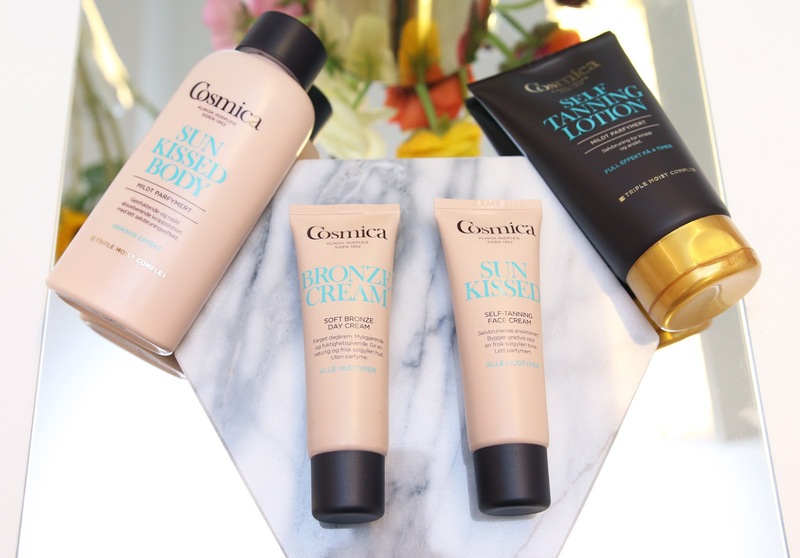 / These four sun products are new in 2016. 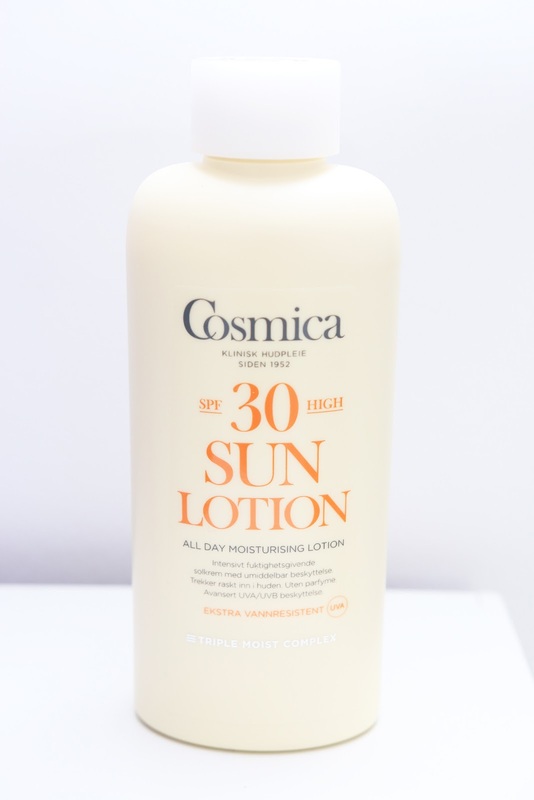 Cosmica's popular Moisturizing Sun Lotion SPF 30 now comes in a big size with 300 ML. Cosmica presenterte nye solprodukter og soltips hos Spalt PR tirsdag 26. april. Apotekene har nettopp fylt hyllene med Cosmica-solnyheter som inneholder en ny formula: Triple Moist Complex™. Ingrediensene Propanediol, Glycerin og Diglycerin fukter huden masse hver for seg, men sammen gir de enda større effekt - både umiddelbart og i lengden. Resultatet er mer fuktighet og elastisitet. Nordmenn er i verdenstoppen når det gjelder antall tilfeller av hudkreft. Ca. 20 prosent av oss får lett soleksem, og da gjelder det å velge høy faktor med høy UVA-beskyttelse. Det er dokumentert at vi smører oss med ca. bare halvparten av den solkremen vi faktisk trenger. Huskeregelen er: Én håndfull til kroppen og én teskje til ansiktet. Størrelsen tilsvarer hånda til den som eier kroppen. Smør deg i god tid før du kler på deg og går ut. 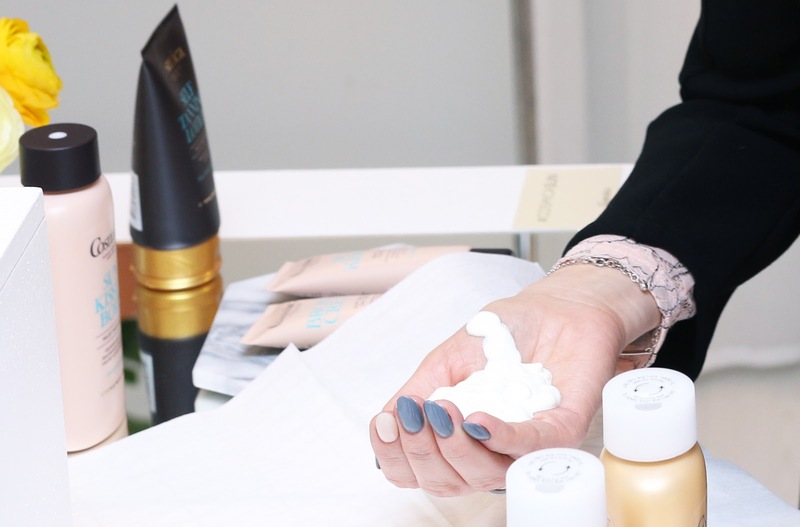 Two self tanning news from Comsica with Triple Moist Complex™. 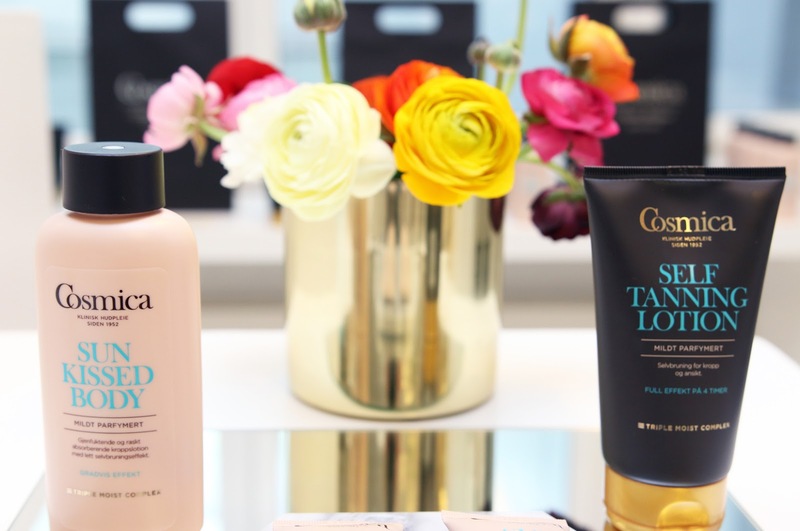 The one to the left is a body lotion that gives a sun kissed glow, while Self Tanning Lotion to the right is a traditional self tanning lotion for the body. Bruk minst en krummet håndfull med solkrem til hele kroppen. For barn gjelder en barnehåndfull. Jo mindre du smører, jo flere faktor-hakk går du ned. La solkremen trekke godt inn før du legger deg ned på håndkledet eller tar på deg klær. Spray beskytter med den faktoren som står på flaska hvis du bruker den slik: Spray og smør utover - gjør dette to ganger. Det er veldig viktig! 50 prosent av solstrålene kan være i skyggen. Derfor er det utrolig viktig å smøre seg selv og ikke minst spedbarn, selv om dere kun skal ligge i skyggen. Unngå sola midt på dagen - mellom kl. 12 og 14 (noen land også frem til kl. 15). Bruk sunstick på lepper og utsatte områder som ører og nese. Faktor 15 blokkerer 93 prosent av solstrålene. Faktor 50 blokkerer 98 prosent. Det er bare fem prosents forskjell! Derfor mener fagsjefen at det stort sett holder med faktor 15 i Norge, men at man kan øke faktor når man drar til syden. Flatt vann gir 15-30 prosent mer refleksjoner. Skumsprøyt øker refleksjonene. Snø reflekterer 90 prosent. Derfor er det ekstremt viktig å smøre seg på fjellet i påskeferien! Høyde har betydning: Gå opp 10 i faktor per 1000 meter. Sola sender ut mer stråler jo høyere du befinner deg! Står det "water resistant" på flasken betyr dette at solkremen varer i to ganger 20 minutters bad. Står det "very water resistant" varer solkremen i fire ganger 20 minutters bad. Solstråler rekker også ned under vannoverflaten. Smør deg med solkrem selv om du bare skal snorkle. UVA og UVB: A = aldring, B = brent. Står det begge deler på produktet, kan du beskytte deg mot både aldringstegn og solbrenthet. Jo høyere solfaktor, jo større miljøbelastning (på grunn av solfilteret). Fagsjefen mener uansett at helsa går foran miljøet i dette tilfellet. ACO bruker uansett veldig få miljøbelastende ingredienser. Du kan se flere solprodukter i mitt forrige Cosmica-innlegg her: Sun & sensibility with Cliniderm & Cosmica. 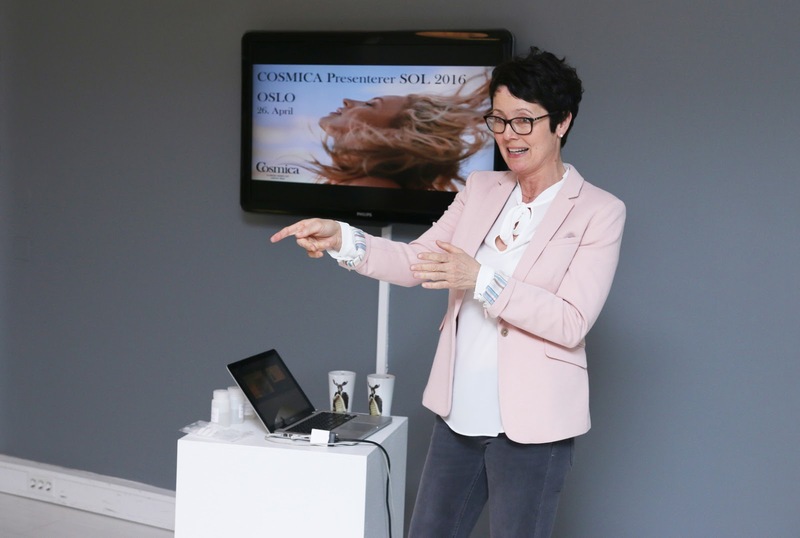 Ingrid Fallet, Conservation Director of ACO Skincare Norway. The sun expert! 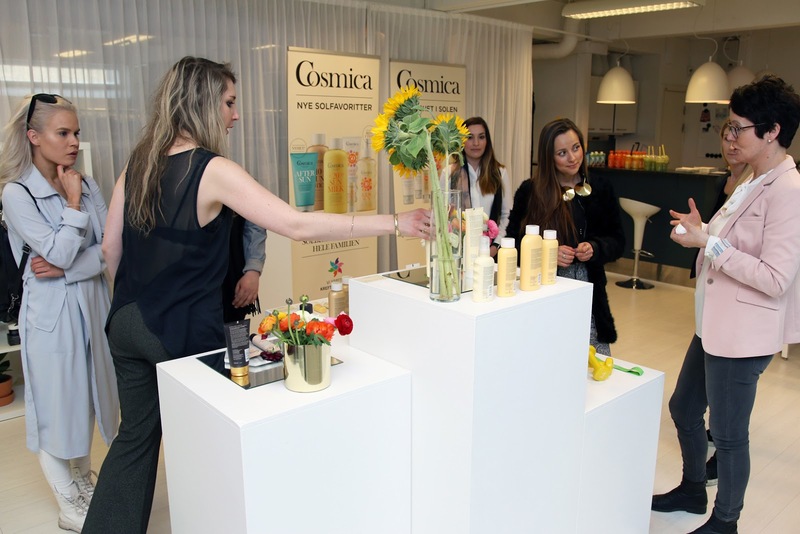 Cosmica presented new sun products and sun tips at Spalt PR on Tuesday 26th of April. The pharmacies have just filled their shelves with Cosmica sun news that contains a new formula: Triple Moist Complex™. The ingredients Propanediol, Glycerine and Diglycerine moisturize the skin separately as ingredients, but combined the effect intensifies - both immediately and in the long run. The result is more moisture and elasticity. Norwegians are among the leading contries in the world when it comes to number of cases with skin cancer. Among 20 percent of us easily get sun rashes, and then it's important to choose high SPF with a high level of UVA protection. It's documented that only half of us apply a necessary amount of sunscreen. The guidline is: One handful to your body and one teaspoon for your face. The size of the handful is equivalent to the person's body. Apply sunscreen in sufficient time before you dress and go out. Remember: One handful sun lotion for the body and one teaspoon for the face! Less than that is not sufficient. Use at least a handful of sunscreen for the entire body. For children, a children's sized handful. The less you apply, the less sun protection factor you get. Let the sunscreen draw in firmly before you lie down on the towel or put on clothes. Spray protects with the factor that stands on the bottle, only if you are spraying and lubricating - twice. That's very important! 50 percent of the sunrays can be in the shadow. Therefore, it's vital that you apply sunscreen, especially on babies - even though you're only staing in the shadow. Avoid the sun in the middle of the day - between noon and 2 pm (3 pm in some countries). Use sun stick on lips and exposed areas like ears and nose. SPF 15 blocks 93 percent of the sunrays. SPF 50 blocks 98 percent. That's only five percent! SPF 15 is therefore often enough. Still water gives 15 to 30 percent more reflections. Sea foam increase the reflections. Snow reflects 90 percent. Therefore, it's extremely important to apply sunscreen in the mountains during the Easter break in Norway! Altitude matters: Use 10 SPF more per 1000 meters. The sun radiates more the higher you 'climb'! If it says 'water resistant' on the bottle: The sunscreen lasts 2 x 20 minutes bathing. If it says 'very water resistant' on the bottle: The sunscreen lasts 4 x 20 minutes bathing. The sunrays also reach below the surface in the water. Use sunscreen even if you're only scubadiving. UVA and UVB: A = ageing, B = burned. If both UVA and UVB stands of the bottle, you can protect yourself from signs of ageing and sunburn. 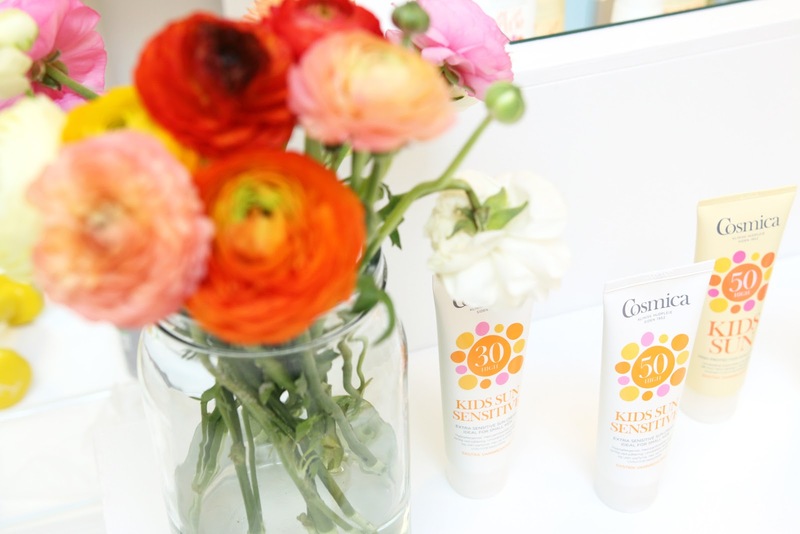 The higher SPF, the greater environmental impact (because of the sun filter). Anyways, ACO uses very few polluting ingredients. 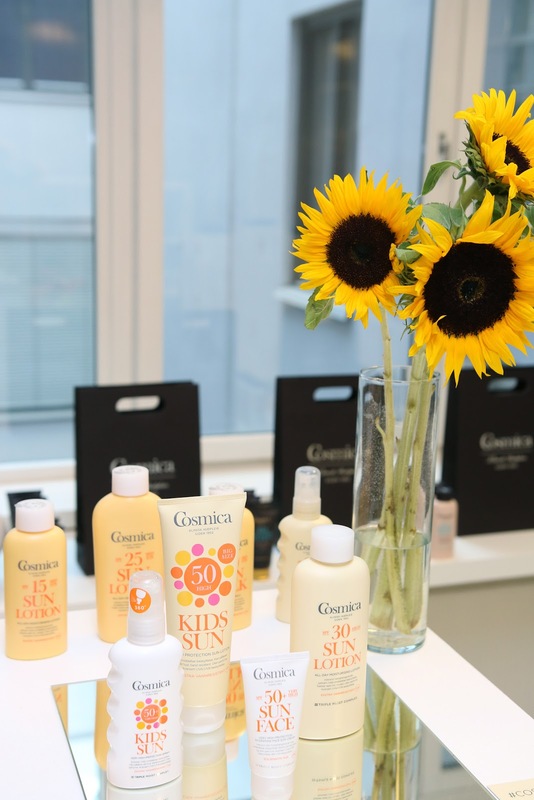 You can see more sun products in my previous Cosmica post here: Sun & sensibility with Cliniderm & Cosmica. 2016 Cosmica news for children: 1. Kids Very High Protection Sun Spray SPF 50+ (for small children) contains the Triple Moist Complex™formula, can be sprayed directly on wet skin and from any angle, even upside down. Spray and lubricate twice. 2. 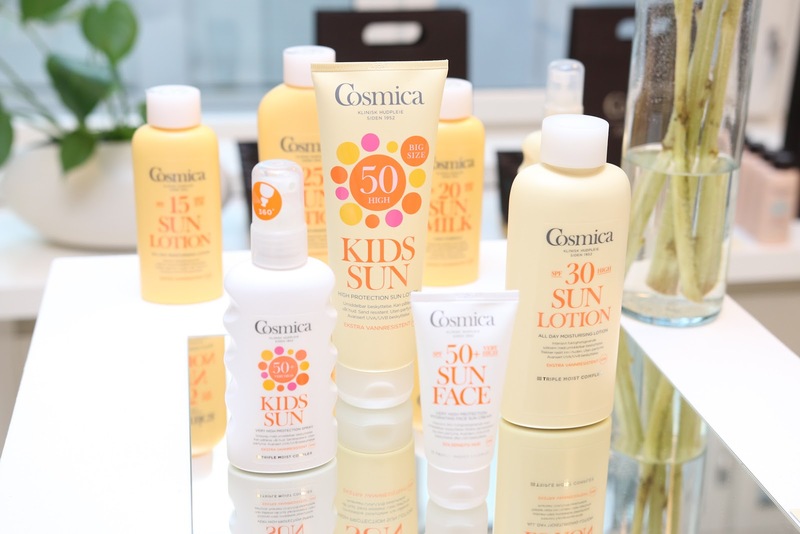 Kids High Protection Sun Lotion SPF 50 (for older kids) can be applied directly on wet skin. Does not contain the Triple Moist Complex™. 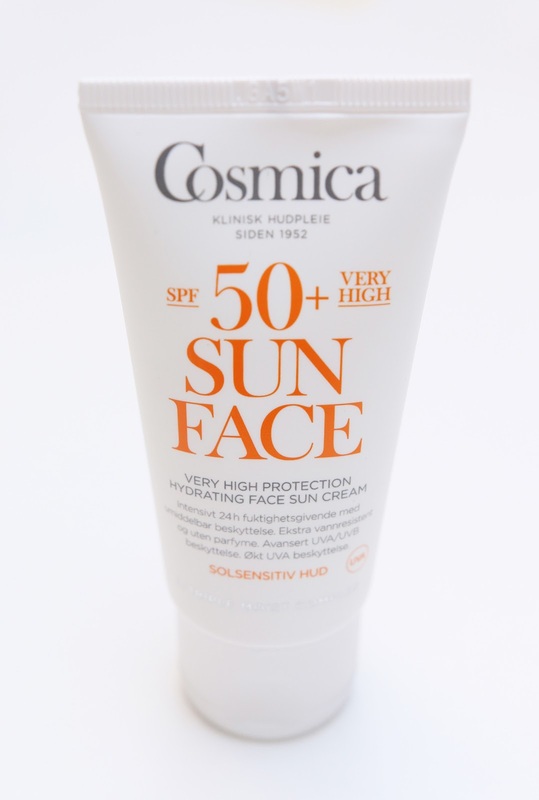 Cosmica Hydrating Face Sun Cream SPF 50+ protects extra against aging. It has a fairly light texture, which is not normal with high SPF. Finally a non-greasy face sunscreen! With Triple Moist Complex™. 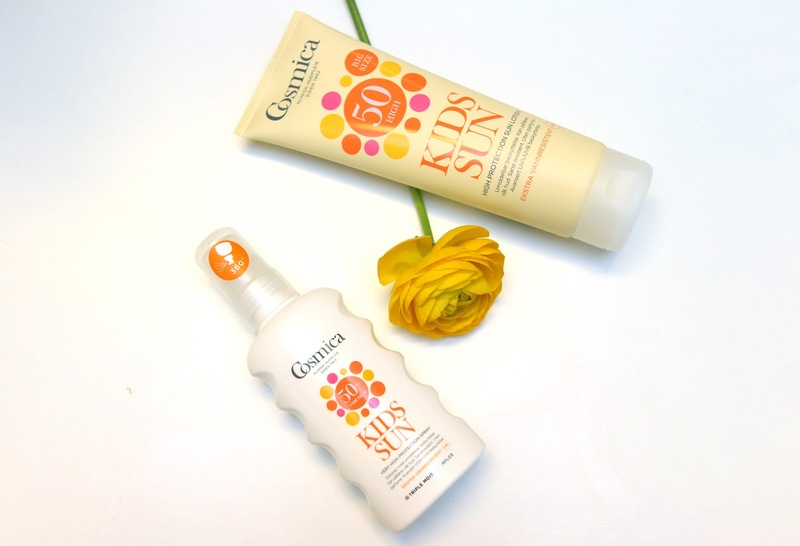 Cosmica Moisurizing Sun Lotion SPF 30 - perfect for the whole family due to the big size of 300 ML. With Triple Moist Complex™.